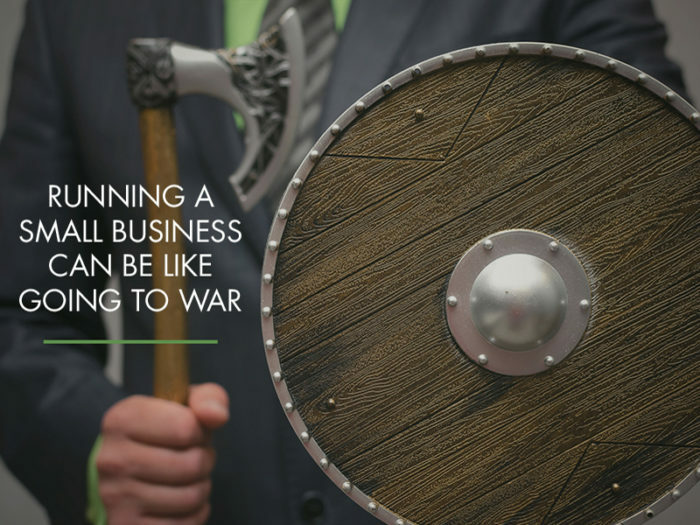 Running A Small Business: 7 Ways Itâ€™s Like Going To War! I was thinking after attending the ANZAC dawn service at my local cenotaph that going to war is not unlike running a small business in some ways. Many volunteers in World War One joined up as they saw it as a big adventure. This is similar to a some of those who leave the comfort of a regular wage to try and make a go of it on their own. The planning necessary prior to making the Gallipoli landings must have been intense. Your groundwork before making the leap to running your own business should not be underestimated either. Too many businesses fail due to a lack of planning. Cash flow models and business plans have been well written about but are so important to small businesses. Yet they are so often neglected. You become the General in charge of all that happens: whether that’s the troops under your command and the logistics of getting supplies to them, or your employees and getting products to market. Consider what must have occurred to get so many men half way round the world to launch an invasion with arms, artillery, and cavalry. Think also about the training necessary for troops to complete the roles that they’ve enlisted for. The same applies to your employees as to those unfortunates who stormed the beaches. The better the training, the greater the chance of success. Consider also the communication required to track the various units after they stormed ashore in complete chaos and to assemble them so that they reached their required destination. You, as the General of your business, need to make sure that all your employees are “on the same page” and pushing to reach the same result too. Many small businesses start out as husband and wife teams, so communication is relatively simple to begin with. But, as the business grows and you, the owner, move further from the “coal face”, it’s important to keep the lines of communication open. Just like the troops, you should also celebrate your successes with the team. It is so important for the morale of your employees that they get to share in the wins. You do not need elaborate affairs; something as simple as a morning tea for a new contract or the completion of the previous engagement will be appreciated and improve team bonding. Letting employees know that you appreciate their efforts and sharing some of the success with them is so important. Like with the troops in any fighting unit, ensure that your employees are not overworked and are taking their leave. Otherwise, it will eventually cost you in terms of productivity. Let the business analogy end there. In closing, let us not forget the sacrifices those brave souls made for our benefit: we live in a country that encourages all to reach their potential. Lest We Forget.